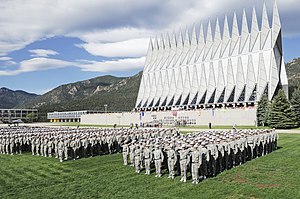 Is the U.S. military coming to be dominated by members of a small, characteristically intolerant sliver of Christianity on a God-appointed mission to harvest souls and battle evil? When considering your government, do you believe in the primacy of Jefferson, Franklin, and Madison or Falwell, Robertson, and Haggard? That is to say, should the peoples’ handbook for governing, educating and protecting the public be the US Constitution or the Bible? Thankfully, for over two centuries the huge majority of Americans have put their faith in the former. In fact, our sacred founding doctrine, with its emphasis on secular governing, clearly sets us apart from the radical religious fundamentalists that we are now explicitly fighting– al-Qaeda, the Mahdi Army and the Taliban—and those we struggle with implicitly—Iran, Hezbollah and Hamas. But now it is increasingly coming to light that over the last decade a fervent minority of fundamentalists have been waging, and winning, a rear-guard guerrilla campaign to seize crucial positions of influence within our secular framework. Some of it has been in plain sight—Bush makes no bones about his willingness to make domestic and foreign policy based on scripture—but there is a less recognizable, more insidious, campaign going on in the halls of congress and within the armed forces. a) they believe they are waiting for the second coming of God’s representative (Messiah) on earth, which will trigger an end-times scenario of mass religious purification leaving only true believers to attain salvation in Heaven. Fundamentalist Christians refer to this as the Rapture. Most Muslims believe that the MahdÄ« will come to help the Messiah (i.e., Jesus) to defeat the Antichrist, before establishing a just Islamic social order in preparation for Judgment Day. c) they believe that it is their duty to actively convert the un-churched, or un-mosqued, and to purify the ranks. It’s their God-given right to proselytize among the unconvinced to save souls—to create the largest possible armies of true believers. There are plenty of other similarities, but you get the point. Let me be clear, I don’t share these peoples’ presumptions, but I believe that they have every constitutional right to vocalize them in our great nation. I have no desire to try to tell these people that what they believe is wrong—how can I, how can one know? But I do reserve the right, actually the Constitution guarantees my right, at least where my country is concerned, to tell them to keep it away from government, schools and the military. After all, I pay their salaries. Shouldn’t we be terrified that our country is engaged in a military struggle wherein powerful forces on both sides control devastating destructive capacity, especially on the Christian side, and who believe it is their higher calling to use any means within their power to lay the groundwork for the second coming and an apocalyptic religious purification? The CRUSADERS by Robert C. Koehler Sixteen words may be all that stand right now between the apparatus of government and the Founding Fathers’ worst nightmare. And those words are starting to give. What’s certain, in any case, is that a lot of people in high and low places within the Bush administration — and in particular, the military — heard him literally, and regard the war on terror as a religious war: “The enemy has got a face. He’s called Satan. He lives in Fallujah. And we’re going to destroy him,” a lieutenant colonel, according to a BBC reporter, said to his troops on the eve of the destruction of that undefended city in post-election 2004. – – – Robert Koehler, an award-winning, Chicago-based journalist, is an editor at Tribune Media Services and nationally syndicated writer. The Pentagon has a disturbing relationship with private evangelical groups. Maybe what the war in Iraq needs is not more troops but more religion. At least that’s the message the Department of Defense seems to be sending. Last week, after an investigation spurred by the Military Religious Freedom Foundation, the Pentagon abruptly announced that it would not be delivering “freedom packages” to our soldiers in Iraq, as it had originally intended. What were the packages to contain? Not body armor or home-baked cookies. Rather, they held Bibles, proselytizing material in English and Arabic and the apocalyptic computer game “Left Behind: Eternal Forces” (derived from the series of post-Rapture novels), in which “soldiers for Christ” hunt down enemies who look suspiciously like U.N. peacekeepers. Apparently the wonks at the Pentagon forgot that Muslims tend to bristle at the word “crusade” and thought that what the Iraq war lacked was a dose of end-times theology. In the end, the Defense Department realized the folly of participating in any Operation Straight Up crusade. But the episode is just another example of increasingly disturbing, and indeed unconstitutional, relationships being forged between the U.S. military and private evangelical groups. The Pentagon’s inspector general recently released a report recommending unspecified “corrective action” for those officers who appeared in the video for violating Defense Department regulations. But, in a telling gesture, the report avoided any discussion of how allowing an evangelical group to function within the Defense Department is an obvious violation of the establishment clause of the 1st Amendment. The extent to which such relationships have damaged international goodwill toward the U.S. is beyond measure. As the inspector general noted, a leading Turkish newspaper, Sabah, published an article on Air Force Maj. Gen. Peter Sutton, who is the U.S. liaison to the Turkish military — and who appeared in the Christian Embassy video. The article described Christian Embassy as a “radical fundamentalist sect,” perhaps irreparably damaging Sutton’s primary job objective of building closer ties to the Turkish General Staff, which has expressed alarm at the influence of fundamentalist Christian groups inside the U.S. military. Our military personnel swear an oath to protect and defend the Constitution, not the Bible. Yet by turning a blind eye to OSU and Christian Embassy activities, the Pentagon is, in essence, endorsing their proselytizing. And sometimes it’s more explicit than that. That certainly was the case with Army Lt. Gen. William “Jerry” Boykin, deputy undersecretary of Defense for intelligence. The Pentagon put him in charge of the hunt for Osama bin Laden and Al Qaeda in 2003. The same year, Boykin was found to be touring American churches, where he gave speeches — in uniform — casting the Iraq war in end-times terms. “We’re in is a spiritual battle,” he told one congregation in Oregon. “Satan wants to destroy this nation . . . and he wants to destroy us as a Christian army.” The story wound up in newspapers, magazines and on “60 Minutes.” And, of course, it was reported all over the Muslim world. The Pentagon reacted with a collective shrug. American military and political officials must, at the very least, have the foresight not to promote crusade rhetoric in the midst of an already religion-tinged war. Many of our enemies in the Mideast already believe that the world is locked in a contest between Christianity and Islam. Why are our military officials validating this ludicrous claim with their own fiery religious rhetoric? It’s time to actively strip the so-called war on terror of its religious connotations, not add to them. Because religious wars are not just ugly, they are unwinnable. And despite what Operation Straight Up and its supporters in the Pentagon may think is taking place in Iraq, the Rapture is not a viable exit strategy. Michael L. Weinstein, founder of the Military Religious Freedom Foundation, wrote “With God on Our Side: One Man’s War Against an Evangelical Coup in America’s Military.” Reza Aslan, author of “No god but God: The Origins, Evolution, and Future of Islam,” is on the MRFF advisory board. Note: Watch the Christian Embassy Video here: http://www.militaryreligiousfreedom.com/ (click on the “Urgent Issues” tab and scroll to the bottom of the page) It’s absolutely chilling! Please consider supporting Mikey Weinstein’s worthy cause by making a donation while you are there.